Perugia is an ancient city located in Umbria, a region in central Italy. It is a very popular tourist destination both for Italians and foreigners due to its rare beauty, the richness of museums and monuments and the nature around it. 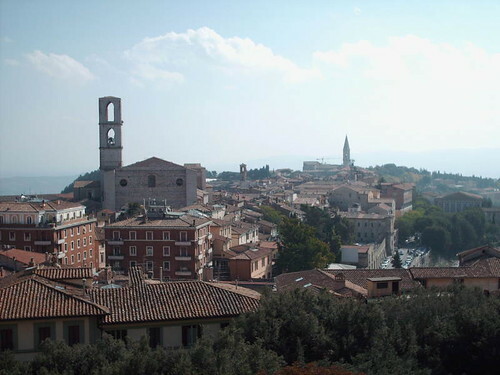 In Perugia major events are also organized throughout the year. The town has a medieval structure with a small center, but because of this it is possble to appreciate it as a valuable ancient perfection. The center is mostly uphill, perched like the medieval architecture required. There are narrow streets lit by wrought iron street lamps, lighting intact angles appearing as a dip in the past. The city is also rich in viewpoint offering wide magnificent views. These views offer the opportunity to appreciate the nature around the city. Perugia actually existed since Etruscan times and it is still possible to find evidences, especially tombs, of this ancient civilization. The most famous is Imho, the Hypogeum of the Volumni, an Etruscan tomb located just 5 km far from the city center. The Etruscan Perugia was surrounded by walls, which are still visible for long stretches to delimit its five historic districts. 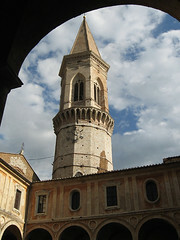 In Perugia there are many beautiful churches, as in many Italian cities. Among the major points of interest there are the Collegio della Mercanzia and the Collegio del Cambio, the Palazzo dei Priori and the National Gallery of Umbria. A possible route could start from the Piazza dei Partigiani (Partisans Square), where you can also park your car. From there an escalator leads to the old city, passing through the Rocca Paolina. Once in the main street of the town, Corso Vannucci, the Fontana Maggiore and the Palazzo dei Priori are within easy reach. Continue then to Via Maestà delle Volte leading to the Roman aqueduct, the Gallenga Palace, home to the University for Foreigners, to the Temple of Porta Sant’Angelo and to the Etruscan Arch. From here a scenic route starts, offering ona of the most beautiful view in the city. All the city gates are particularly interesting. The Porta Pulchra, which the Romans later called Porta d’Augusto, is the most impressive. Going on there is Piazza Fortebraccio. 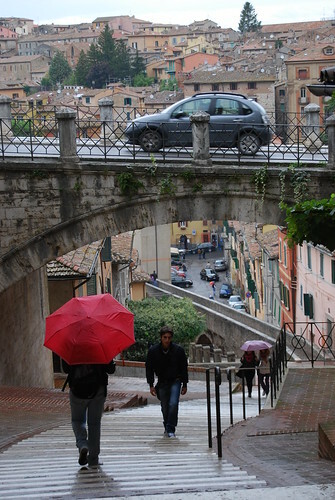 Via delle Prome is a very steep road leading to the highest part of the city. In this area you will find the early Christian church of Sant’Angelo dating from the fifth century and you can reach the medieval district of the Conca. The deconsecrated church of San Francesco al Prato stands in a large square covered by a green lawn. Passing through the arch you get to the Academy of Fine Arts and the Museum. These premises were formerly a convent dedicated to St. Francis. Continuing along Via dei Priori you reach Piazza IV Novembre, the city center, where la Fontana Maggiore, decorated with 50 reliefs and 24 statues of Nicola and Giovanni Pisano, is located. 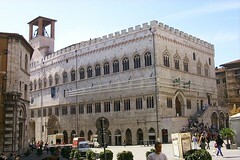 In this square there is the Palazzo dei Priori, built between the thirteenth and fifteenth centuries. Inside the palace the Sala dei Notari is one of the most popular. From here you access to the National Gallery of Umbria, housing the largest collection of Umbrian paintings from the thirteenth to the nineteenth century. Opposite the Palazzo dei Priori there is one of the sides of the Cathedral of St. Lorenzo, who has the front facing the old market square, Piazza Danti. This is also where the Collegio della Mercanzia and Collegio del Cambio are located. In the center of the square there are the remains of an Etruscan well dating from the third century BC. Going down Via dei Priori, you get to Porta San Pietro (St. Peter Port), and then reach the Basilica of San Domenico and the Church of St. Peter. The Church of St. Peter is one of the most beautiful religious buildings testifying the stori of the whole city. Perugia is also acclaimed for the University, which was inaugurated in 1307 by Pope Clement V.
Thanks for reminding my first one month stay in perugia. The city is actually wonderful with its Etruscan streets and lovely architecture.